Shirdi Sai Baba Stories,Leelas and Teachings. 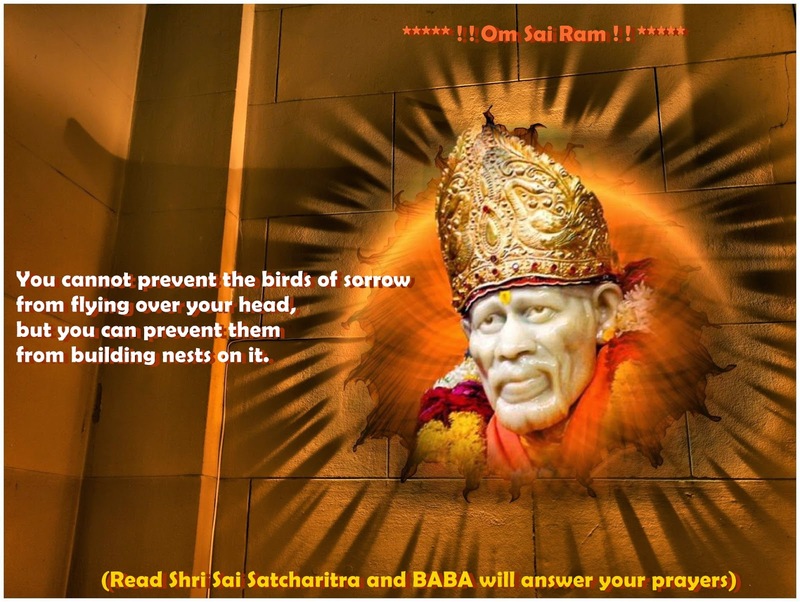 : Shirdi Sai Baba's Grace-Experience Of Sai Devotees-Part 68. While nearing Lord Venkatesa I was really excited and was very eager to see the Lord. I felt some chill and started talking to myself. I thought he must be Sai. Then we started moving and there was Lord Venkatesa standing with all attributes. And instead of saying Govinda, I said Om Sai Ram and worshipped him. It was hardly three glimpses. I felt happy. We returned home safely. The next day after my evening prayers, I started reading a book named "Life of Sai Baba" by B.V. Narasimha Swamiji. Previously, I was reading it for a long time but couldnt complete it. I have left the book halfway and stopped reading altogether for more than a week. Suddenly I thought of completing the book and Lo... I was stunned with what I read that day.I could'nt keep quiet after reading those lines and I captured an image of my desktop screen and have attached it. (Sorry for the real bad camera of my phone). I will quote exactly those lines for reference, "Incidentally it may be noted that Tirupati Venkatesa and Sai are not different. Sainatha Manana says, Venkatesastu Sayeescah Tayor bhedatn Na Vidyate Tayor aikyam Smaran Nityam Tat Sthanam Labhate Narah this means, Venkatesa is indeed Sayeesa or vice versa, Sayeesa is the same as Venkatesa. There is no difference between the two. Perpetually remembering this identity, one reaches that position of Venkatesa or Sayeesa. As may be seen from the historical sketch of Sai Baba's growth and development in his last birth, He attained his present position, as stated by himself several times, by the grace of Venkatesa, his Guru. His Guru was originally named Gopal Rao, but had become identified with Venkatesa. 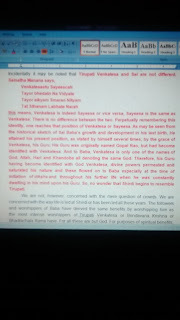 And to Baba, Venkatesa is only one of the names of God, Allah, Hari and Khandoba all denoting the same God. Therefore, his Guru having become identified with God Venkatesa, divine powers permeated and saturated his nature and these flowed on to Baba especially at the time of initiation of diksha and throughout his further life when he was constantly dwelling in his mind upon his Guru. So, no wonder that Shirdi begins to resemble Tirupati." All of a sudden these lines came up. Should I have to say how I felt. I was shocked and sat still..... for I cannot express my happiness. Even those who read this can feel the bliss. Om sai ram. Good Evening. My own experience in Year 2016 - Sai Ram. I am a computer engineer in a reputed software company. This started with the word of a cattle handler in the city of Ghaziabad (U.P.). As a daily routeen, after doing pooja of Sai Baba in the morning, I offer breakfast to him. As in Sai Satcharitra Baba has already shared his views through Hemandpant (who wrote it) as 'those who offer food to cow, dog or any other form are actually offering food to me'. With his kind directions, I am accustomed to offer breakfast to any of these creatures considering like offering to Sai Baba. One day when I was offering Chapati to a cow then owner of that cow who had other cows too told me that please do not give food to this particular cow. This is useless cow for last 4 years. Just eating his stuff and is heifer (not getting pregnant) for last 4 years. That day I told that cow owner that now I will offer my food to this particular cow only and will do prayer to only lord of this world (Sai Baba) to help this cow. Since that day, I started giving Udi (Babhuti which I had received from Shirdi) to that particular cow in a breakfast and did request to father Sai Baba for help. Believe me with Sai Baba's blessings and Udi within a months period that cow's 4 years old problem got resolved without consulting any Vet and cow owner and his wife both told me that Sai Baba heard your prayer and this cow is now pregnant. I swear of my children and parents, whatever I am writing is a fact and therefore, I shared even a Year in an Introduction column at this site. If you may just read Sai Satcharitra and will believe in only lord Sai Baba, your all worries will surely be resolved very soon. He is our real father and looking after very well of his children. Thanks lot for creating this beautiful website for us to share our eternal experiences of our Sai Baba's miraculous presence in our life.Thanks a lot Baba for your unconditional love on us and helping me write this beautiful experience I had with you every now and then. Manisha ji am writing for the very first time in any of the websites and Baba made me to do so om Sai ram. To start with my mom is Sai devotee but when I was in childhood though I might have experienced Baba's presence I never knew it due to ignorance.I got married 6 years ago in which first 3 years we were in India and am always very spiritual prays all god never leaned to one in particular though my mom is our Sai devotee. We are in USA now as my husband came through his company almost 3 years now.We wished to have baby and went to doctors treatment etc and had 2 miscarriages where only myself and my husband suffered the greatest loss of our baby. My husband handled the toughest time we come across. I was unable to come out of it ,even now.One of my friend told me to do Sai Vrat pooja.Me and my husband did the pooja just expecting the result and in parallel trusting doctors treatment without knowing Baba will do everything. But all our treatment failed ,myself and my husband totally dejected and we stopped praying, got angry on all the god and removed all the gods photos from pooja place. But honestly it created very big vacuum and always felt like crying . I felt bad for my behavior so had only few gods photo in which Sai Baba was also there but we just prayed mechanically. One of my friend shared her experience about the Sai vrat pooja this Thursday 4th Jan 2017 where Baba blessed recovery of a new born who had serious heart problem before completion of the vrat. 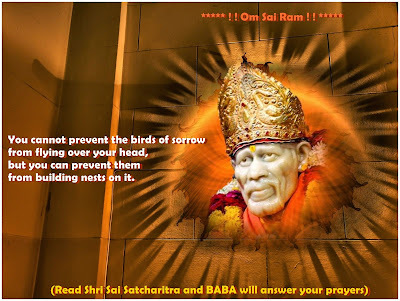 From that moment our beloved Saibaba entered into my heart and unknowingly I searched for baba blessings and prayers where Baba made me read some stories in this Sai website where baba makes me comfortable and answers my prayers. I kept on reading the devotees miraculous experience of our saibaba's presence day and night unknowingly and the next morning Friday I took our Baba's photo which was kept inside a bag and was planning to hang in wall but I kept in pooja place and started reading Baba's stories and kept Sai baba photo(which my mom sent long back) on my phone lock screen . Next morning when I woke up I saw Sai baba's photo but baba was seeing somewhere just his hand in blessings position .Surprisingly Baba made me place his idol and photo in the original place where he used be in my pooja place.After morning pooja I again started reading Baba's stories and felt like seeing baba's photo on my phone. Surprisingly I saw Sai baba was looking at me with beautiful smile and blessing. I was happy and jumping out of joy, told my husband about the same but he didn't experience that time. I kept reading the stories came across devotee experience where baba blessed them with child and insisted my husband to read that baba's miraculous blessings story ,he also read then and than we went sleep. I woke up in the evening And saw baba' photo on my phone locked screen but this baba didn't look at me I felt bad whether he is angry on me or did I do anything wrong but didn't know what to do? I did pooja to Sai baba and completely surrendered at his feet with full faith I pleaded baba to see me ,talk to me ,forgive all sins knowingly or unknowingly I did. I kept begging him literally and came from pooja and played baba's songs in Tv. My husband told me I will try to stream Shridi Sai Baba's live darshan so he kept trying to connect from iPad to Tv but didn't get connected and I sat down reading a devotee stories where baba answered my question "How come mother will get angry on children am always with you " and there was answers for my miscarriage too that all my sins are washed away will soon be blessed with baby. 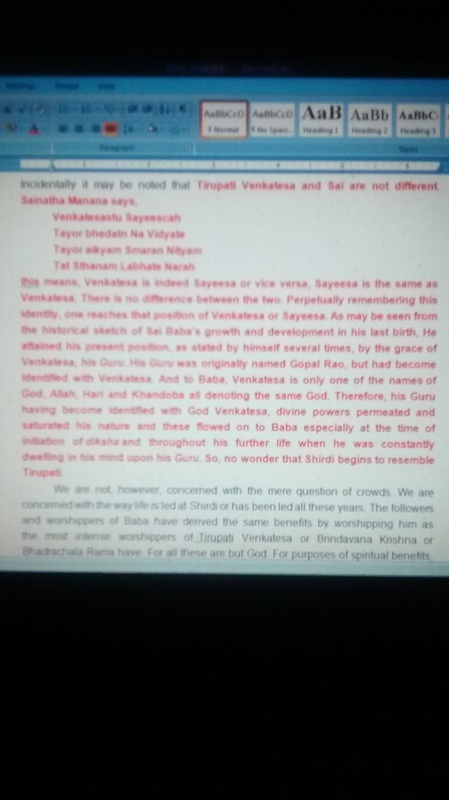 I was very happy reading those lines and felt like to see baba's photo on my phone ,saw baba seeing somewhere and my phones locked screen gets blacking out in seconds and I was pleading Baba in my heart looking at Sai photo on my phone locked screen to see me and show mercy on me here where Sai baba showed us his darshan through my phone. To my surprise immediately Sai Baba started looking at me with smile blessing and couldn't believe this. I was in joy, my husband was still in the effort trying to connect live darshan. I immediately called my husband to see baba photo who is seeing me with smiles and the eternal miraculous moment happened I still feel that moment where my phone lock screen got froze without blacking out and Sai baba continuously saw both of us in specific ,his eye balls literally moved focusing us individually .We both were in divine world and tears rolled down for his greatest blessings . Baba came to our house hearing my prayers with faith continuously for 5 minutes .Sai baba was with us giving us live darshan .See Baba's plan for us and here we were trying to connect in tv but he came directly to us in live .Immediately we ran to our pooja room and thanked Sai infinite times for his unconditional love on us .It took time to come out of this miraculous eternal moment immediately I felt like to share with my mom I tried to sent the same baba's photo and typed gm(short form of good morning) automatically the word "mom" popped up which was another miracle then shared the same with my family in India everybody had the same feeling which I had. I will upload the same photo through which our Sai baba gave us darshan for all the Sai devotee to feel same. Saibaba's love is unconditional he loves us so much that we cannot even imagine.Today afternoon one of my friend called me to come with her for first bath to a new born. For some reason I avoided but felt uneasy and saw the same- Sai Baba on my phone he was not looking at me I felt very bad I told I will go to the baby's bath only if you see me and give a smile immediately Baba started looking at me with smile as if giving a green signal . I went there, they gave the baby I fed milk to baby in feeding bottle and was helping in giving him bath. After that I was having the baby through out with me .Manisha ji you will be wondering why am I telling this ....here is our Sai Baba's blessings for me that cute little baby boy name is "SAI MITHRAN ". Sai Baba your love for us is unconditional and you always have all of us close to your heart.You expect nothing in return other than true love and complete faith. Dear Sai devotees thank you all so much for reading this long post I just want everyone who reads this gets Baba's darshan and divine feel we had. Sai Baba expects nothing just faith,love and patience Baba will surely bless us what we wish and pray also give us more than we expect ,his love is unconditional even if we fall at his feet he picks us and keep close to his heart. Om sairam thank you thank you for your love and blessings. I am searching for Navaratri poojan and Shree Saibaba, but could not find anything on internet. If anybody knows any referance kindly enlighten .